Chemistry and Biochemistry Senior Instructor Emeritus Ralph Barnhard passed away on February 23, 2019. 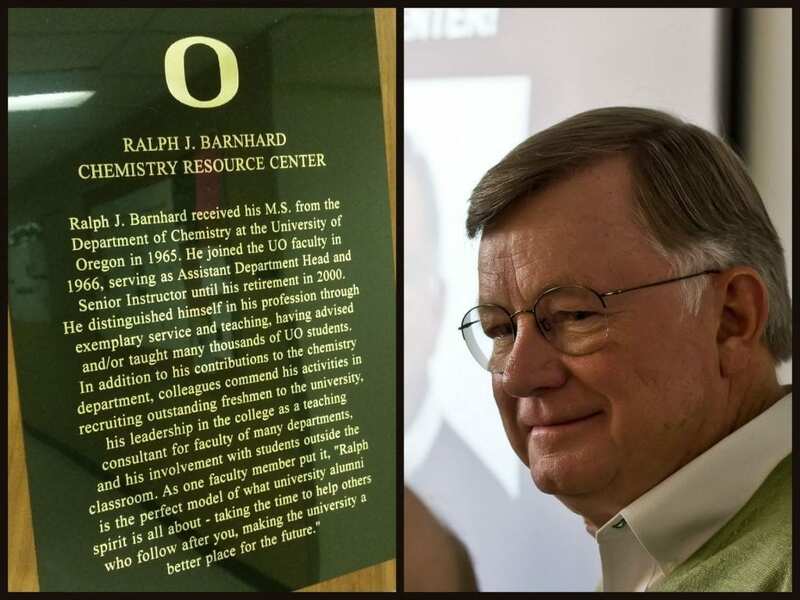 A UO alum, Ralph earned his Master of Science degree in Chemistry at the University of Oregon in 1965 and joined the department’s teaching faculty in 1966. Over the following 34 years, he taught thousands of chemistry students and served as assistant department head. Ralph retired in 2000. Ralph is remembered as an outstanding educator with a wholehearted commitment to his students, This sentiment was underscored in April 2011 when the department dedicated the Chemistry Resource Center in his honor – a new classroom and adjoining suite of rooms for peer tutoring and teaching assistant office hours. Ralph’s obituary can be found in the Register Guard. Alum Sam Prakel, Class of ’18, in the News! 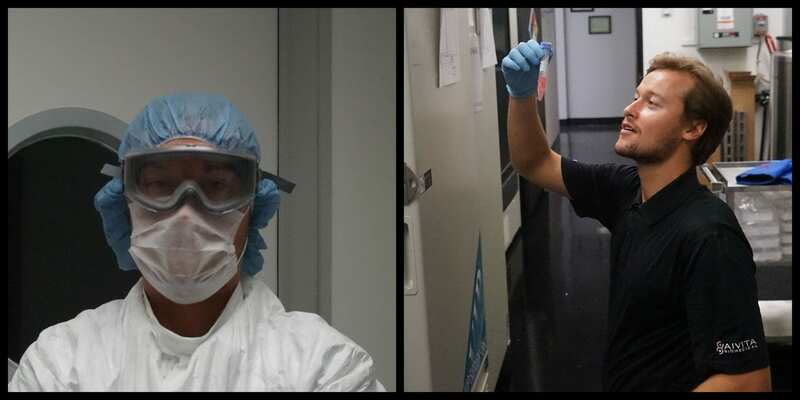 In case you missed it – Updates from UO Chemistry and Biochemistry Alums! Over twenty alumni from the 1950’s through 2010’s checked in with us for our 2018 Chemistry and Biochemistry newsletter – find out what they are up to below! Do you have some news, an accomplishment, or an update you’d like to share? Fill out our Alumni Spotlight Form and we will post your news to the Alumni Spotlight section of our blog and to our social media. We love hearing from our alums! Click here to visit our Chemistry Newsletter archive for news from previous years. UO Chemistry and Biochemistry alumna Meng Ouyang was recently interviewed for a news piece about her experience with the Friendship Foundation, which pairs host families with international students attending the University of Oregon. Meng received degrees in computer science, chemistry, and law from the UO. She earned her M.S. in Chemistry in 1999. Eric Nummedal, BS ’16, now works as a researcher for Aivita Biomedical. Biochemistry alum Eric Nummedal credits his years at the University of Oregon for preparing him so well for his current role researching and manufacturing cancer immunotherapies that he recently reached out to the Chemistry and Biochemistry department, hoping that by sharing his experience he might pass on some of his enthusiasm for his work and encourage current undergraduate students as they prepare for a career in the sciences. Eric grew up in Irvine, California, and when considering where to pursue his undergraduate studies, he was drawn to the UO for what he saw as its commitment to progress. Once here at the university, Eric did not hesitate to take advantage of those resources and make the most of his undergraduate years, participating in the Science Literacy Program, the Oregon Undergraduate Research Journal, the Student Affiliates of the American Chemical Society, and the College Scholars Program. His academic efforts earned him several awards, among them a McNair Scholarship – a federal program that supports students as they earn their undergraduate degrees and complete research projects in their fields of study. For his undergraduate research, Eric chose a project with a focus on the visual system. He worked with the Niell Lab in the Institute of Neuroscience, and presented his findings at the 2014 McNair Scholars Symposium. Eric graduated in 2016 with a Bachelor of Science in Biochemistry and Biology. After graduating, Eric worked at two biotech start-ups before transitioning to his current role as a Research, Development, and Manufacturing Associate at Aivita Biomedical, a regenerative medicine company. The company’s central focus is developing immunotherapies that will enable the immune system to eliminate cancer. 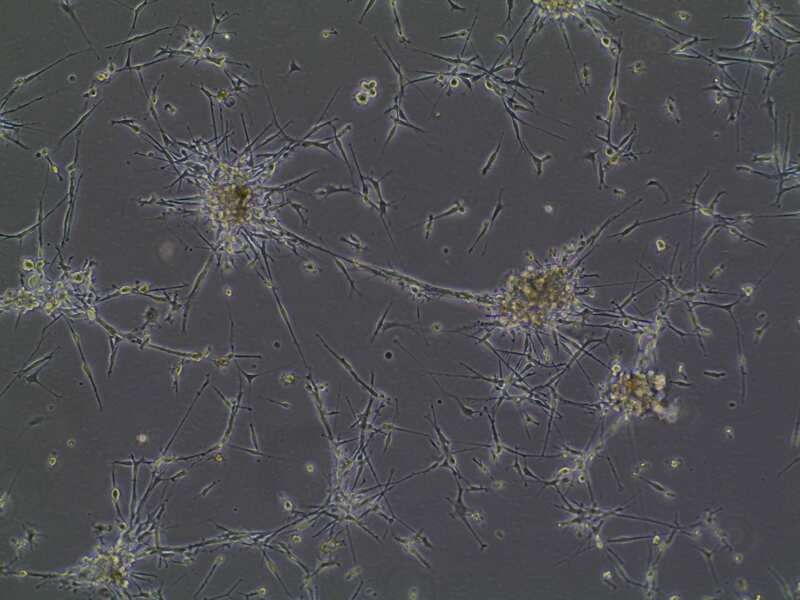 Cancerous glial astrocytes (neural cells from glioblastoma) being grown in the lab in order to train the immune system to recognize and eliminate them. In addition to cancer research, they are also working to develop stem cell-derived 3D-transplantable retinas to treat vision loss. Eric’s favorite aspect of his current work is the opportunity to participate in the creation of life-changing immunotherapies for cancer patients in desperate need of hope. Eric is thankful for the encouragement and support he received along the way, from friends and family as well as professional colleagues – and he’s hoping to have the opportunity to pass that forward. Current students and alumni are welcome to reach out to Eric via LinkedIn if they have questions or would like to know more about his experiences as a UO undergrad or working in the sciences. 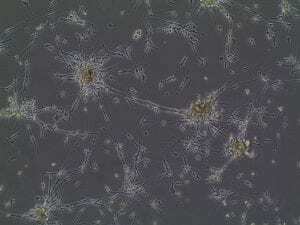 Alum Jesse Keicher‘s company, Symmune Therapeutics, popped up in the news recently! The biotechnology startup focuses on the treatment and prevention of pulmonary infections and pulmonary diseases. Keicher received his bachelor’s degree in Biochemistry at the University of Oregon in 1999, and went on to earn a UO master’s degree in chemistry in 2000.